Having accepted his prophesied role as Storm Dragon, Gaven travels to Argonnessen, the land of dragons, to learn more about the Prophecy and what it foretells of the fate of the world. Meanwhile, Haldren ir'Brassek is forging new alliances in an attempt to seize the godlike power that Gaven now wields, and Aunn, Haldren's changeling agent, journeys into the Demon Wastes on an ill-fated mission that could plunge Khorvaire back into war. 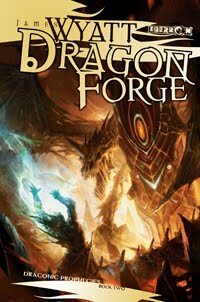 Learn more about Dragon Forge at the Wizards of the Coast web site, where you can also find author interviews and read a sample chapter. Dragon Forge was released in June 2008 in hardcover. The paperback edition came out in April 2009.